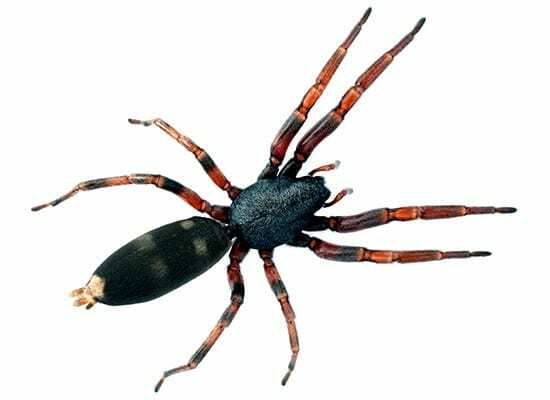 Whitetail spiders frequently occupy Melbourne homes. They seek shelter in dark nooks and crevices and at night time they go about their business eating other spiders found lurking around the home. As they don’t spin a web to catch prey, when it comes time for them to rest, they sometimes find problematic places. Towels and toys left on the floor, curtains and bedsheets and lonesome shoes are a common hiding place. Whilst they are not vicious spiders, they will bite if feeling threatened. It’s easy to see how an unsuspecting human can quickly become the recipient of a painful venomous bite. Common signs and symptoms of a Whitetail Spider bites include instant pain similar to a bee sting. There is redness, discomfort and swelling. Ulcerations can develop and the recipient is left open to the possibility of infection at the site. In a minority of victims, there is the potential to suffer a nasty reaction such as flue like symptoms and anaphylaxis. The first step in getting rid of Whitetail Spiders is to identify them so effective pest control can be undertaken. Whitetail spiders are slender looking and approximately 1-2cm in length. They are typically greyish but sometimes brownish in colour with orange and brown banded legs. They are easily recognisable because the white marking on the tip of their tail. Homes with Whitetail Spiders should be “spider proofed”. Seal nooks and crannies, install fly screens, clean up gardens and remove piles of dry bark and debris. However, sensible measures such as these are not 100% fool proof. Where there is a will there is a way! As Whitetail spiders feed on other common house spiders, their determination to enter the home will remain. Take active steps to remove cobwebs in the home. The Whitetail spider uses the web spun by other species to mimic the struggles of a trapped insect. The Whitetail tricks its prey into investigating the disturbance before striking. Removing cobwebs will remove the Whitetail spider food trap. Enagaging the services of a licensed Pest control company will ensure you have the ultimate level of protection. Qualified technicians are trained to identify and know the behavioural patterns of Whitetail spiders. They can assist you in basic spider proofing measures and undertake treatment of infested areas in the home. Importantly, only the affected areas are treated with environmentally friendly and legally registered safe pesticides. Areas treated include roof voids, nooks and crannies, skirtings, backs of wardrobes, under beds, around windows, bathrooms and around the perimeter of the home, extending to the letterbox, clothes line and garden shed. Blanket spraying of pesticide is best avoided. Areas treated include only those where the Whitetail spider is likely to come in contact. Are you worried about spiders in your home? PestAway Australia has a team of dedicated Spider Technicians. They are trained and qualified to safely treat homes and places of business where spider infestations are reported. We offer free no obligation quotes and same day service.